Producer Barry Letts didn’t quite fulfil his dream to out-do the longest-ever Doctor Who serial, but what he did engineer for the show’s tenth anniversary was a twelve-episode arc. The first half of the arc constituted Frontier in Space, and although the Daleks did not appear until episode six, their presence was felt via their slaves the Ogrons. It was the next six episodes which would feature the Daleks in full force and a different writer was to be employed. 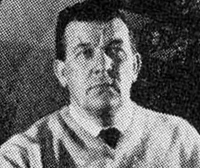 In agreeing to allow his creations to return in Day of the Daleks, Terry Nation had negotiated first refusal on any future stories concerning the monsters. Barry Letts and Terrance Dicks therefore approached Nation with the offer for him to script the second half of the epic story arc, and it which was eventually commissioned on 21st April 1972. 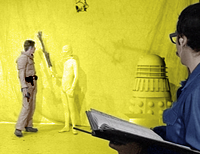 Nation worked on the scripts – initially entitled Destination: Daleks – over the summer, with the final drafts being prepared by Dicks himself. It was Nation’s first script for Doctor Who since he penned episode seven of The Daleks Master Plan – ironically an instalment featuring no Daleks because it was the series’ first and only attempt at Christmas pantomime. The concept of bridging two stories became diluted by Nation’s approach to the writing, and he scripted part one of what became Planet of the Daleks as if it was a stand-alone story, rather than a follow-on to Frontier in Space. 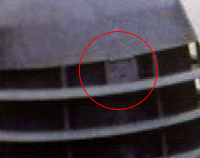 Even in the finished version, the Daleks are hidden until the climax of episode one, and the Doctor expresses shock at the reveal – despite the fact that he is supposedly on a mission specifically to track them down. Dicks had to re-draft sections to incorporate the injury that the Doctor suffered at the end of the previous serial. Having not written for his own creations for seven years, Nation’s instinct was to take them back into familiar territory, and ultimately his return to science fiction writing proved extremely derivative. From his own previous tales Nation borrowed broad themes and settings, such as a jungle planet (complete with malevolent plant life) and an underground city, as well as familiar protagonists in the form of the Thals and antagonists such as invisible natives. He also repeated set pieces including an escape using a Dalek casing, immobilising a Dalek visiting its prisoners, infiltrating the Dalek base disguised as their ally, crashing debris down a shaft to fend off a rising Dalek, and of course, the ubiquitous army poised to take over the universe. Meanwhile, due to a lack of space at the BBC a company called Westbury Design and Optical Limited was contracted by the BBC to store and renovate the TARDIS console as well as deal with Dalek requirements. This company belonged to Clifford Culley who became the man primarily responsible for the visual effects work on Planet of the Daleks. With scripts prepared, December 1972 saw work begin on readying the Dalek props for production. The story called for 10,000 Daleks to be woken from their hibernation and whilst this could be partly realised by model-work, it was clear that some shots required more than the three available props. The decision was made to celebrate the tenth anniversary of the programme (and indeed the Daleks) by building a set of new props. To this end, the outside visual effects team was tasked with creating seven new casings and construction began in earnest at the end of December. Having been returned from the Lord Mayor’s Show, Dalek Six-7 was available to Cliff Culley and his team for measurement and they would make every effort to faithfully ‘clone’ the standard Shawcraft appearance. 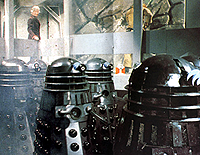 The new Daleks became the first set of props built without using the original Shawcraft methods developed in the 1960s. Gone were the fibreglass shell and pushed-through hemis, and in came a heavy, wood construction for the skirt with the shoulders being made up of thin metal wrapped around a wooden frame. 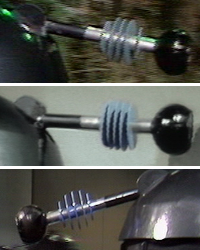 The design of the new casings shared much more in common with Dalek Six-7 than its counterparts: The newly-built shoulder sections had normal-width collars beneath the gunboxes (unlike the thin collar of Dalek One), the position of the fixing screws was high, the gunboxes themselves were original ‘TV style’ (unlike the flat-tops of Dalek Seven), and even the hemisphere alignment of the first ‘clone’ closely matched the movie-style skirt. Perhaps the most telling sign of the prop which was copied was the eye. 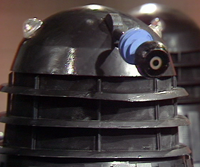 At the end of 1972, Dalek Six-7 was left with only four eye-discs, and its pivot was slightly more recessed than the others. Sure enough, the new batch of props have this same same incorrect eye-disc configuration, and they all have very recessed eye-pivots indeed. The new Westbury Design props were given fully-articulated limbs so that they could all be posed differently, and in most respects they were very accurate replicas. There were small differences however: The eye-pivots were barely visible above the dome, and the new neck rods were made of a single round piece of wood rather than the ‘clover-leaf’ style. The three original Shawcraft props would remain the hero props and carry the bulk of the work on the story, whilst the additional casings would act as static scene-fillers. Since they were to be given no dialogue and would often act as impassive guards, the new props were given the affectionate term “goons” by their creators and the production team. This was a joke reference to the 1930s slang for hired thugs, which in turn derived from the slow-witted and muscular comic strip character Alice the Goon. The first two “goons” were finished by new year 1973, just in time for production to begin. They were painted battleship grey, somewhat lighter than their veteran counterparts. The lack of standardised molding techniques during the building of the new ‘Goons’ gave rise to slight variations in the dimensions, and as each new prop was fabricated and time grew shorter, the quirks became more pronounced. Most notably the hemisphere layout strayed further from the norm with each prop turned out. As a result of both the building methods and the circumstances, each prop had its own unique features – to a far greater extent than the first Shawcraft props ever did. To help future clarification of what type of prop component is being referred to, the “Goons” will be given Roman Numerals. Goon i was immediately identifiable by its sagging front slats. This quirk was unique and is noticeable throughout the story. The skirt was unusual in that panel R1 was narrow, requiring panel R2 to be wider to compensate. The hemisphere positions were as consistent as any Goon, and the rear corner panel had an arrangement apparently mimicking the movie-style flaw. Goon ii‘s hemispheres were distinctive by having the gaps between each row increasing in size from top to bottom. Its shoulders were unusual in having seven small slats above the gun and arm boxes; reminiscent of the movie props – and as a consequence the rearmost small slats were set far back. The transition between the two sizes of slats was notable too, as the top of the small slats at the front was considerably lower than the full slats around the rest of the shoulders. Goon iii was requested by the production team to be painted yellow, as it was needed in the climax of part one and would be used on the CSO set with yellow as the chromakey colour. This would be its only use in the entire production and the prop is only seen on screen from the shoulders upwards. Slats L1 and L2 were slightly misaligned so that they leant towards each other, and the dome of the head sat low on the neck section. Goon iv had a host of distinguishing features. Whilst there was not quite such a significant drop in height from the large slats to the small, there was a wide lateral space at the point they changed. The front two slats were positioned extremely close together. The arm and gun-balls were mounted extremely low within their boxes, resulting in a tiny gap between the joint and the bottom of the gunbox. The hemispheres on the front panels R1 and L1 were misaligned too low in relation to panels behind. Goon v‘s front panels were very wide and the hemisphere alignment was variable. The line of the rows rises up towards the front with panel R1 being particularly high. On the shoulder section, again the top of the larger slats was considerably above that of the smaller front slats. The slat R1 in due course became detached from the mesh and leant outwards. The gunboxes of Goon v were somewhat more square than various other Goons, however the ball-joints were no higher than on others, resulting in a significant gap between the gunball and the top of the box. Goon vi had perhaps the most distinctive skirt of all. The hemispheres on the side panels were set extremely high compared to those ahead of them. But more severe issues concerned the front panels, where the four hemispheres were mounted so close together that a gap of nearly ten centimetres was left below them at the bottom above the fender. The most noticeable feature of the shoulders is that its slats leant towards the centre. Finally, Goon vii was hardly featured at all during recording, appearing once as a guard at the gates of the Dalek base and on the fringes of publicity photos. Like Goon Two the shoulders had seven small slats, with the rearmost small slats mounted far back. The BBC’s own visual effects team were given the job of carrying out work on the existing props, although in the event very little needed doing to the trio. 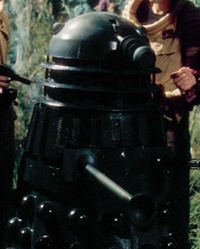 Dalek Six-7 was by this stage the same lighter ‘battleship grey’ of the first two Goons produced by Culley’s team. 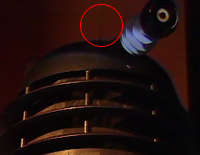 The prop now sported the dome that Dalek One had used during Power of the Daleks which included a hole in the top that had been used in the production line scene. The eye now had a sunken pivot (although it retained the original eyestalk). The neck had been removed for the repainting and when placed back had been rotated into the wrong position. Dalek One-5‘s condition had deteriorated quickly after the production of Day of the Daleks and although it had been patched up for its appearance in Frontier in Space it was again starting to look worse for wear. The shoulders had picked up damage, mesh was missing between the rear slats, and sections of the neck rings were also starting to split. The gold Dalek Seven-2 now needed to become one of the rank and file Daleks and was therefore painted to match Dalek One-5 in a dark grey finish. The rapid job is evident as the effect is variable across the prop. The underside of the eye pivot remained gold, and patches were left on the gun barrel and under the mesh of the shoulders. It was a sad irony that the BBC recognised the importance of the Daleks in attracting viewers to the show but unfortunately simply didn’t have the time or money to constantly refurbish these props. Some of the components at this stage were a decade old, and that fact was plain for all to see. With two new Goon props available, filming began with two days on location at Redhill on January 2nd 19731. The VFX team on location consisted of Cliff Culley, Pete Pickering, Arthur Beavis and Martin Gutteridge who together looked after the Daleks and worked to create the ice pools of the planet Spiridon. Dalek Seven-2 plus the Goon i and Goon ii were taken on location – the latter pair always referred to by Culley and his team as “ours”, in contrast to those props which survived from the 60s which they referred to as “the BBC’s”2. The scenes depicted The Doctor and Taron wrestling Dalek Seven-2 towards the ice pool, eventually winning the battle, with the final shots seeing Goon i as a substitute for the hero prop, sliding into the water. Goon ii soon joins its companion when the Thals and Jo manage to overpower it. Goon i and Goon ii were fitted with hinges on the rear of the neck to allow the head to pivot open as the story required. Damaged sustained by the props required repairs to be done upon return to Pinewood. On 4th January Culley was contacted by the BBC over concerns that the two new goon props were not the appropriate shade of grey to match the hero props, and needed to be painted darker. The following day Culley went to Ealing to pick up a section of one of the Shawcraft Daleks to colour-match the two goons. 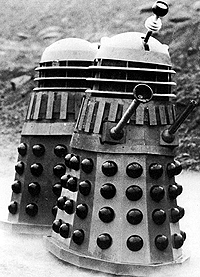 In addition to the large number of normal Daleks which were demanded by the script, one more Dalek was called upon. 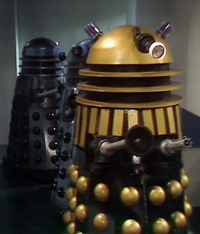 Terry Nation’s last three stories had featured a Black Dalek as the supreme leader. However, once the series went into colour, gold had become the preference for the aliens’ ruling class. 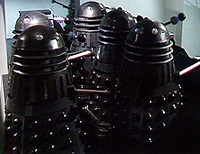 Dalek Seven-2 had most recently fulfilled this role, but with the large number of props required for the Dalek army, it was not a desirable prospect to lose one of the three hero props in order to portray the representative of the Dalek Supreme Council required in episode six. As part of his role as Production Assistant (for which he went uncredited at the time) George Gallaccio was involved in managing the resources on Doctor Who, and as such had one eye on the budget. As a money-saving measure, he explored the fact that Nation himself owned several Dalek props left over after the second Dalek film. Four years earlier in an interview on Whicker’s World, Nation’s movie Daleks had been featured, and so one of these was put forward as a candidate for a starring role in Planet of the Daleks. A complete explanation and analysis of which movie props appear on Whicker’s World, and what happens to them can be found on the Nation’s Daleks Page. 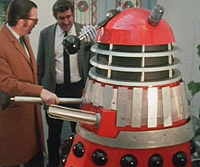 On the 10th January 1973 Gallaccio contacted Cliff Culley regarding the use of one of Nation’s private collection as the Supreme Dalek. The prop chosen was one that had originally been built in 1965 and painted gold and silver for use in the second Dalek movie – Dalek AaruII 12. After filming was completed, it had been refurbished into a red and black colour scheme, which was how it appeared on Whickers World. Four years on, the prop had undergone some major changes and had got mixed up with one of Nation’s other Daleks. It now had the skirt of Dalek AaruII 9 thus becoming Dalek AaruII 12-9. Its neck had been reconstructed with flat-sided rings and gone were the rods. The lights had been replaced by purple jam jars and the eye was now a torch that was unusually wired to flash along with the speech. Despite the changes, this prop’s identity is easy to spot through its lifetime mainly due to the rivets of its slats being so widely spaced. 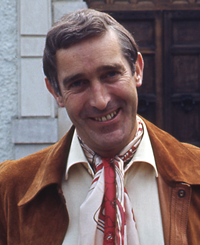 This unique quirk can be seen on the big screen, then again in Whicker’s World, and through to its use in Planet of the Daleks. Small details give it away too – prominent rivets under the mesh at the front and rear can be matched up throughout all its guises, and after sustaining damage in 1973, the red paint of its 1968 appearance was revealed beneath the Supreme’s Black coat. On 16th January tensions ran high as bad organisation caused Terry Nation’s Dalek to fail to be delivered. Friction continued on 23rd when a row broke out over who was responsible for looking after the props. Studio work at Television Centre began on 22nd and 23rd January 1973 with the taping of episodes one and two. No Daleks were needed on the first day as the session was taken up with most of episode one. The climax of the episode which included the reveal of the invisible villains would be filmed in the second block in February. The second day would feature the first studio work using the new Goon props. Goon ii was painted black from its shoulder area upwards to feature as the Dalek that the Doctor and Thals had to spray with paint to reveal. The lights and eyestalk were completely covered by this process. This Goon was one of two which were distinguished by having a ‘movie style’ arrangement of seven small slats above the gun and arm boxes, rather than the usual six. More of the Goon props were ready for filming of the second block which began on 5th February. The new batch included the one painted CSO yellow to record the effects for the climax of episode one. This was Goon iii which was videotaped against a yellow background whilst the actors sprayed black paint to reveal it. This was the only screen use of Culley’s third prop however its all-black FX double, Goon ii, is seen in several scenes with paint-covered eye and lights. This blacked-out appearance was finally addressed in a refurbishment for episode six when it was fitted with new lights and eyediscs (although the iris remains black). Thereafter the prop is used as an FX prop which gets destroyed – twice. Although intended predominantly as static scene fillers the Goons did have some moments where they were seen to move, although they were never manned by an operator. Episode Four would see two of these instances. Firstly a scene called for a Dalek to rise on an ‘Anti-gravitational disc’ and this was achieved by pulling Goon i up on a wire threaded through a hole in the top of the dome. The prop was mostly kept in close up to hide the stage hands steadying it. 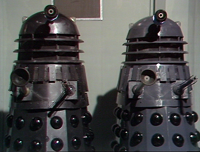 The same episode also included a scene which utilised the three Shawcraft hero props together in the laboratory set, but a fourth Dalek was needed to come and give its report. The role of the fourth Dalek was fulfilled by a Goon kept in close shot near the camera whilst being wobbled by a stage-hand out of frame as it delivered its lines. A more ambitious attempt was made to mobilise a Goon during the recording of episode Five. When the Daleks panic at the premature release of their virus culture, a Goon prop is catapulted from one side of the set to the other. This experiment proved fairly unsuccessful as the resultant acceleration was was unusual. The previous years’ publicity work, combined with the extensive use of the props in studio meant that damage was repeatedly caused to different areas of the props. Even during recording, the props were prone to rough treatment. For example; Dalek Six-7 collides with the lift door whilst escorting the Doctor in episode two and in episode three and the neck of Dalek One-5 is damaged during the escape scene. But even before Jon Pertwee wrenches one of the neck rings out of position and breaks it, they already show signs of a fracture and some partially delaminated wood. This was straightened up, only to be broken again recording part six. Dalek One-5’s different eye discs. Culley was tasked with repairing the props as needed and on 2nd February he was provided with a list of defects from the operators themselves. The process of making running repairs is exemplified by Dalek One-5’s eye-discs. In an insert recorded later and edited into episode two, the discs are all the same diameter, and a bolt appears in the pivot. Later, in episode six they have been refurbished and appear in a regular pattern. Dalek Six-7 also receives a new disc for the episode. 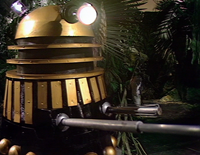 Dalek Seven-2 would see one of its slats broken even before filming began, revealing the gold paint underneath. This was painted over for recording, and Culley’s team were kept busy throughout making minor repairs and touching up paintwork to all the props, old and new. The final studio day for Planet of the Daleks was 20th February 1973 which involved the massed ranks of the Dalek army being represented by most of the Shawcraft and Westbury props together. With work completed, the Supreme prop was returned to Terry Nation, and the ten other Daleks were returned to Pinewood for storage – but this wasn’t the end of the drama. Clifford Culley kept a production diary, from which excepts are reproduced in Steve Cambden’s book The Doctor’s Effects. This production diary indicates that there were only two props built in the first weeks of filming, with Culley being given instructions on how to paint the next prop, upon its completion. The terms used in Culley’s diary.